DETAILS: This coastal chic beach cottage is the perfect getaway for a any vacation, Its located in the Crossings District of the WaterColor Community. This home is situated near one of the 5 swimming pools that the WaterColor community offers, also you would enjoy going for a walk or a bike ride through this beautiful community. The first level of this beautiful home features a king bedroom with a flat screen television and a private bathroom that features a double vanity and a gorgeous walk-in shower. 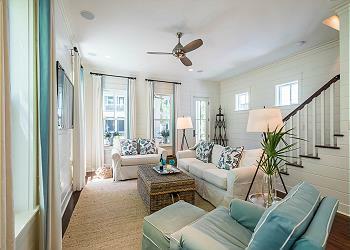 The living area of this home boasts plenty of space while you relax in the cool, beachy hues of the modern decor. The living room area is equipped with a large flat screen television and a blue-ray player for movie nights or rainy days indoors. 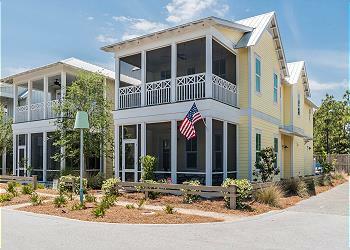 Enjoy a relaxing day at home on the furnished porch while appreciating the beauty of the tranquil community. The open floor concept of this home allows you to enjoy the simplicity of the dining area that beautifully compliments the kitchen. The dining area seats eight guests comfortably with additional seating at the kitchen island for four. The second level of the home has three bedrooms, The first bedroom on the second level is the Master Suite it features a large king bedroom, with a private bathroom with a walk-in shower and double vanities. Off the Master Suite is the 2nd floor balcony, enjoy your morning coffee right outside the bedroom or a evening looking a the stars while having a glass of wine. Right down the Hall is the King Bedroom with its own private bathroom with a walk-in shower and single vanity. The last bedroom on the second floor is the queen bedroom which has a shared bathroom, The queen bathroom has a single vanity with a shower and Tub combo. This unit also comes with a bonus feature of a Bunk Room on the second floor and a living/Den area, this home is also offers wireless high speed internet. We had a great time at the cottage! It’s beautiful home with the perfect amount of space for both our families. It was close to everything in Watercolor and the golf cart was the kids favorite part. Definitely recommend it and using 360blue whose service was superior. Looking forward to another stay in the area soon! We are so delighted that you all nejoyed your stay with us in this amazing home in Watercolor! We agree that this home is set in a wonderful location and having the golf cart for your use makes getting to and from the beach and surrounding areas a breeze! We are so glad that your experience with us was perfect and we hope to be able to host you all for many years! The Quintessential Cottage was perfect! We loved the layout of the house and location as well as everything Watercolor had to offer. Everything went well. The property was a good size fir our family. The golf cart was a must for us to get around in Watercolor. The heated pool was nice for this time of year. We are so pleased to hear how much you and your family enjoyed this home for your vacation in Watercolor! We agree that the golf cart is a must for the Watercolor area making it easier to get around and enjoy everything our little slice of paradise has to offer. Thank you for staying with 360 Blue, we hope to see you again soon! Our big crowd (11) was very comfortable in the 22 Wintberry property. 360 Blue was very responsive to our info and one minor repair request. We are so glad that you enjoyed your stay with us in Watercolor and that we were able to correct any issues during your stay! Thank you for staying with 360 Blue, we hope to see you again soon! This was my first stay in Watercolor, and I could not have been more impressed. First, the house was amazingly spacious. It comfortably housed our group of 10 for the entire week. Our linens and bedding were clean, and the house had all the amenities you would need. Secondly, the location was perfect. We were just a minute walk from the grocery store, and the neighborhood was nice and quiet. The house also provided bikes and a golf cart that we were able to use to go to the beach each day. Lastly, the house was so cute! Each room had a unique style, and it was all cohesive. I would definitely recommend this place to any of my friends, and I cannot wait to go back! Sounds like a truly incredible stay in this beautiful home, we are thrilled that you enjoyed your time here. We loved having you with us and we hope to see you back soon! We are so delighted to hear that you enjoyed your first Watercolor vacation! We agree that this home and location is perfect for a fun and relaxing getaway! The photo you shared with us is amazing! We look forward to seeing you all again very soon! Great home and nice layout. Quiet location but still close enough to all the best shops and locales. Home was perfect for us. Property management was so responsive and helpful with any of our questions or concerns. Great time overall! Thanks for letting us stay with you!! 360blue is the best, and we mean it since this is our 13 straight year coming to 30A. We’ve stayed in water sound, Santa Rosa, five times in 4 different properties in watercolor (twice in one house), and sea grove. This location is the best and 360Blue has been the best! We are beyond thrilled that you had a wonderful experience and a fantastic experience with 360 Blue! We agree that this homes is in a perfect spot and is a great choice for an amazing beach getaway! We look forward to helping you in the future and hope that we see you soon! This is a beautifully appointed home! Perfect for entertaining family or friends. Very comfortable and a fantastic location. The furnished porch faces onto a tree lined walkway. Within walking distance of the Publix market and shopping center. Every amenity and wonderful attention to detail. A piece of paradise! We will be back again. 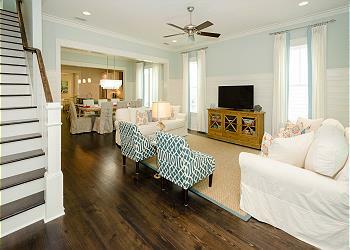 We are so thrilled that you enjoyed your beach getaway in this beautiful home. We loved having you with us and hope to see you back soon! My family just spent the week at “Quinnessential Cottage.” Great experience! Well equipped home. Perfect location-short walk to the beach, but away from the traffic/congested area of 30A. Would definitely stay here again! We are so delighted that you had a great experience in this charming cottage! The location is perfect- the beach and everything that WaterColor has to offer is just a short walk away, without the hassle of being in traffic. We would love to have you as our guest again soon. Thank you for your feedback! 6 Seater Golf Cart Included!